High quality mineral oil for chain and bar lubrication of chainsaws. It contains special additives that provides tackiness for non drip, anti-wear for even better lubrication, anti-oxidation and anti-heating for extended operation and protection. 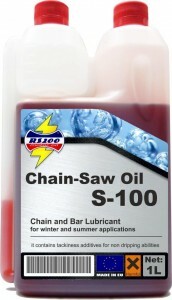 The viscosity is designed for full season operation.